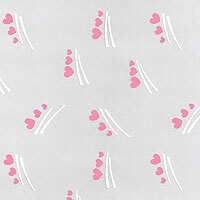 3 Pink Hearts Dash Cellophane Roll 24 inches wide x 50 ft long. Pretty pink hearts with two white lines under each set of 3. Cello background is clear. We have other items you might want to consider for a gift basket with a heart theme.